As we approach the beginning of the outdoor season, we will continue to profile track and field coaches (and many that coach cross country as well) to our California coaching legend series. We have a lot of choices that cover the entire spectrum of events but as always, if you have coaches that you would like to nominate, please let us know on twitter @milesplitCA or you can email us at albertjcaruana@gmail.com, jgeorge@milesplit.com, and jeffrey.parenti@flosports.tv. There are legendary high school track & cross country coaches. There are legendary community college track & cross country coaches. There are legendary college track & cross country coaches. There are legendary national and international track-cross country coaches. Then there is Bob Larsen, who quietly fits that description at all of those levels, either with a team or an individual. Mentoring Meb Keflezighi to an Olympic silver medal in the marathon as well as unprecedented victories in the Boston and New York City Marathons has just been the latest in a long line of success stories for Larsen who started coaching five decades ago at Spring Valley's Monte Vista High just east of San Diego. Larsen made his initial impact by capturing San Diego Section cross country titles from 1964-1967, well before there was ever a state meet. However, his 19 points in 1966 was the lowest until the section expanded to five divisions in 1996. "I always respected coaches who could work with different athletes," said Larsen. "In high school, for example, you don't get to pick your athletes. The idea is to get the best out of each athlete. In track there are distance runners, sprinters, jumpers, throwers--hey, even pole vaulters--so you match the athlete's talent and personality with the team. 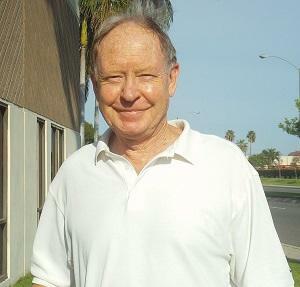 He moved on to Grossmont College where he guided the Griffins to seven consecutive cross country titles. The track team set 11 national records in 12 years. In 1976 he was talked into pulling together some of his standouts at Grossmont College and from around San Diego County to have a little fun and, as the Jamul Toads, go for a National AAU Championship. No one knew who they were let alone challenging the likes of the Florida Track Club or the New York AC for a national title. So the team of Terry Cotton, Kirk Pfeffer, Ed Mendoza, Dave Harper, Tom Lux, Thom Hunt and Dale Fleet stunned the cross country world by winning. Larsen moved on to UCLA where all he did was win the NCAA track championships with the Bruins in 1987 and 1988, post nine Pac-10 titles and be honored as the National Track Coach of the Year four times. His dual meet record in 15 years: 118-3-1. For most that would have been enough, but while Larsen was coaching a young San Diego High graduate named Mebrahtom Keflezighi to four NCAA titles in cross country and track (Meb swept the 1600 and 3200 California state titles in 1994 and was a Foot Locker National cross country runnerup in 1993), he saw much bigger things for the native of Eriteria. After being named the 2004 National Olympic coach, Larsen moved his base to Mammoth Lakes where his team included Deena Kastor and Keflezighi, who that summer would go on to win Olympic bronze and silver respectively in Athens. Keflezighi and Larsen worked so well together they teamed up to win the New York City Marathon and in 2014, when all of the world's eyes turned to the Boston Marathon a year after the bombings, Keflezighi became the first American to win in 31 years. 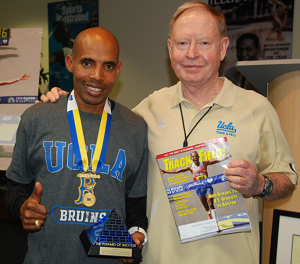 "He's a great coach," said Meb, who retired from running internationally last fall. "He's humble and easy-going. He gets you to trust in the process and when you're down, he'll get you to look back to see how much you've accomplished and how much more you can do. "He works with you and encourages you. He's a 'show me what you got' kind of coach--the best." Finally, a legend should have a movie about him, and Bob Larsen does. It's called "City Slickers Can't Stay with me," and for track or cross country coaches, athletes and fans, it's a can't miss treat.